Last week Team Adem payed it forward by donating 100 coffees to be given to carers of patients at the Nambour Cancer Care Unit. Carers often sit for hours with their loved ones while he/she is receiving cancer treatment. Team Adem would like to acknowledge the wonderful contribution they do by offering carers a quality coffee, tea or other hot beverage. Carers will be given a token and can redeem their hot beverage at the very popular Jamoke Expresso Bar – across the road from Nambour General hospital. We would also like to send a big thank you to Jamoke owner Jodie who loved the idea so much that she has also donated another 100 coffees, so that’s 200 “Coffee for Carers” Wow! 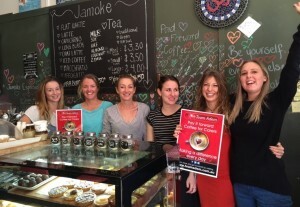 Thank you, Jodie & the Team at Jamoke for Helping us help others.